We offer many types of upgrades to the 16SR. Super-16 upgrades are covered on our Super-16 Conversion page. This page covers all other upgrades to the 16SR. Dual 11-pin Fischer conversion for Arriflex 16SR I-II. This is a highly reccomended upgrade for your 16SR. You will probably never need to use the existing Tuchel socket. It is only used to provide pilotone cable sync with an analog tape recorder that does not have crystal sync. So why leave it there using up valuable space on the back of your SR? Instead, you can have what you really need – another 11-pin Fischer socket to power your Video Assist, Zoom Control, or other accessories. Our conversion uses a perfectly sized bushing to adapt the size difference between the Fischer socket and the existing opening in your camera’s tailpiece for the Tuchel socket. The new Fischer socket is perfectly positioned and will not rotate or come loose, even when used by not-so-smooth camera assistants. The second Fischer socket is designed for accessory use. It is always on, wheras the camera’s original Fischer socket is only on when the camera is in “Standby” mode (except SR-IIE). It can power accessories, and is oveload protected. It can also be used to switch the camera on/off. We do not connect the additional fuction lines to this plug to protect the camera’s electronics. 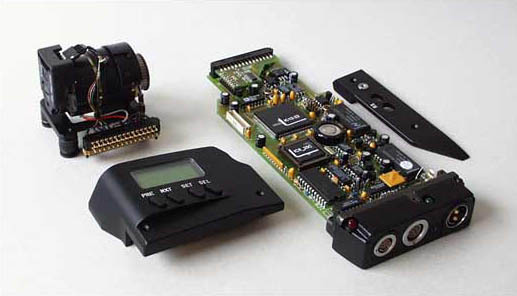 This prevents anyone from connecting two speed controls at once, or some other conflicting combination of accessories that could damage the camera’s electronics. If you need it for a special application, we can connect the additinonal signal lines. There will be a charge for addtional labor time. Our Fischer conversion is available with the original type Fischer socket, identical to the one that’s already on your camera, or you can also specify the new SR-3 style Fischer socket (with the cool-looking nut). Turn-Around Time: 1 day based on appointment and parts availability. One of the things that will always identify your camera as an SR-I (besides the marking on the base) is the standby/on/off switch cover. Although ARRI designed the new SR-II switch cover so that it will not fit on an SR-I, we have worked out how to adapt it. This conversion requires a small modification to your SR-I’s tower casting. The modificatinon updates this area of your tower casting to the SR-II design, and is hidden by the switch cover. Turn-Around Time 2 days based on appointment and parts availability. Note on ARRI SR conversions: Please plan ahead if you would like to have these upgrades done to your camera. The parts, although available, are normally not kept in stock in the U.S. All have to be imported from Germany/ Switzerland and this can sometimes cause delays of up to 3 weeks. We try to keep a few pieces in stock at our facility, but they are used up frequently. If we do not have parts in stock, we will require a 10% deposit with your initial order. We will then order the parts, and contact you as to when to ship your camera to us. The balance will be due upon completion of the work. We accept credit card payments through PayPal, as well as Company Checks and Money Orders/ Certified Checks.